Who Will Save The Tablets? There are other advantages to the iPad that made the two previous version worth owning. However, the sublime display in the new iPad really finishes the job. It’s hard to think where Apple will go with the next iPad — besides lighter and thinner. My bet is on software. I felt this way for about six months, before I put down the iPad and hardly ever used it again. By then, only my three year old son and my wife were using it for the occasional game and education app. Yet, this wasn’t my first iPad. I had had an iPad 2 before, which I used almost daily over a nine month period. I had sold it one month prior to buying the newer one, for the sole reason of upgrading to the rumored retina iPad. So what went wrong, why did I stop using my iPad 3? It was thick and heavy at 9.4mm and 650g. It wasn’t at all comfortable to hold, even when sitting on the couch. This is worsened by the fact that I would feel its heat in my left hand after a short while of use. I never thought of the iPad 2 as thick and heavy, yet it was 0.8mm thinner and 40g lighter. But as is typical with such things: once you become used to them, it is hard to go back. And the iPad 3 definitely felt like a step back, even if you consider that display. It was underpowered to comfortably drive its high resolution display. Animations and scrolling would stutter at times and the display suffered from a wave effect when scrolling text in portrait. Apps didn’t launch as fast as before and they would install slower because of the much larger retina graphics. The tablet was constantly pushed to the edge of its performance, which was evident by the amount of heat that it produced. Its battery-life was slightly shorter than the iPad 2 but still acceptable. Yet the time it took to fully charge shot up 50% to about 6 hours on a wall charger, and it doesn’t charge when in use —it even discharges slightly. Charging an iPad required planning when you used it as often as we did. All of these issues resulted in a product that had lost its magic to me. The iPad as a device was conceived to fade into the background and become the app you were using, or the content you were reading. Instead, this iPad didn’t fade away: your hand and arm felt it was there, your eyes could see it struggle, and you had to be mindful of when it needed charging. Apple knew it too: a short eight months later they released the iPad 4 which solved the performance issues by means of the new A6X processor. So, to come back to my quote, I had it wrong. The retina display didn’t finish the job. It made a good product worse and it wasn’t until the iPad Air, 1.5 years later, that most of my issues with it were fixed, or reset. But that isn’t the complete story. The iPad had performed a job that I wasn’t going to use my laptop for. With nothing to replace it, I probably would have kept on using it. Yet, in the fall of that year something happened that eased my transition away from the iPad. Apple released the iPhone 5. I bought it on day one to replace my aging iPhone 41. The iPhone 5 was lighter, thinner, faster, it had a bigger screen, double the RAM, and longer battery-life than my iPhone 4 it replaced. It wasn’t a perfect substitute for the iPad in every way, but it was good enough. Today, we are on the verge of one or two —depending on which rumors you believe— bigger screen iPhones. My iPhone 5 is ready for an upgrade, if only to replace the 4 I handed down to my wife. Come fall, will I still have a need for my iPad Air? It seems that phones, tablets, TVs truly are becoming just different sizes of glass. It might just be that phone-sized glass suits me the most. Posted on 2014/07/16 2017/09/25 Categories UncategorizedLeave a comment on Who Will Save The Tablets? WWDC’14 is a go. Many people are excited about what Apple has planned for the keynote this year. As the public headline of their developer conference, the keynote has always centered on iOS and OS X in recent memory. This seems to be the case this year too, judging from the leaks by Mark Gurman of 9to5Mac. The highlight of these rumors is a complete visual redesign of OS X 10.10, and the introduction of Healthbook: an aggregation platform for health data in iOS. However, the overall feeling (pundit wishful thinking) is that Apple might have something else up its sleeve. In 2010 the iPhone 4 was unveiled, in 2012 the first retina MacBook Pro, and last year the new Mac Pro. With Tim Cook repeatedly promising new products this year, the tension is rising. Feasible candidates for an introduction at WWDC are the long-rumored 12 inch MacBook Air with a refreshed design and a retina display, a refreshed Mac Mini, and some kind of health accessory to go hand in hand with the Healthbook introduction. I’m keeping my expectations low. I suspect it will only be about software updates to current products. Yet, I’m really looking forward to a shocking redesigned of OS X. On the iOS side, Apple will also want something to pitch during the keynote. Healthbook is indeed the most likely contender, as the iPhone already has a number of sensor readings and third party accessories that can be aggregated in the app. Furthermore, it’s obvious that the redesign that began with iOS 7 will be further refined in iOS 8. For the third year in a row: improved inter-app communication. This would enable to more easily chain together apps and construct more elaborate workflows. For instance, taking a picture with the Camera app, sending it off to one or two editing apps, and posting it on Instagram. This introduces many user-facing problems that need to be fixed though. Things like default applications and scaling share-with dialogs. Multi-user support on iPad. iOS could make use of fingerprint unlock to transparently support multiple home screen and app configurations. Development effort and iPad sales are at least two good reasons why Apple would never implement something like this. Apple Wallet Service. Use you AppleID and coupled credit card for online and retail payment. The iPhone would undoubtedly play a big role here. (a) Better way of doing browser tabs in Safari on iPad, (b) an overhaul of keyboard auto-correction (especially on iPhone), (c) focus on advancing iOS for iPad, (d) better ways to manage apps on the home screen, (e) AirDrop that works reliably, fast, and between Mac and iOS devices, (f) Siri in more languages (Dutch) and with app integration, (g) a fix for the app silo problem where documents (files) only exist within a particular app, unless you store them on DropBox. I don’t want to venture a guess as to if and when iOS would adopt these features. It is clear Apple is again spread thin between finishing what they started and working on hot new products. What If the iWatch is Another Hobby? It remains unclear whether Apple will introduce a wrist band type device any time soon —the Apple TV has been a subject of intense interest for the past six years— but since the introduction of the Samsung Galaxy Gear we have a pretty good idea what it won’t be like1. Then what could be the function of such a device, if Apple were to design it? I think a good bet might be that it’s at least about sensors2. Do you remember the Nymi bracelet from a few days back? It’s this wrist band that reads your heartbeat and turns it into a signature that some other nearby device, like a smartphone, can use to uniquely identify you. In theory, this would render our dependence on passwords a horribly clumsy thing of the past. We don’t know if it’s real and if it works as advertised, but the idea has the simplicity and elegance of something that Apple would come up with. Then again, as far as the rumors go, Apple seems to have included a fingerprint reader in the new iPhone, that could serve a similar purpose. The list of possible sensors for specific purposes is long. But the key question remains, what good is a display on wrist band, when a much larger and better one is right there in your pocket? Besides it being a display-less sensory device for identification, or for collecting sports or health data, I can think of at least one other purpose. A problem I have with the iPhone is that I don’t notice when it vibrates or makes a sound as a result of a notification, when it’s safely inside my jeans pocket, or when it’s laying silenced on my desk at work. A wrist band that makes a sound or that vibrates might be able to fix that too. It can do that easily without requiring a display. Since this device would obviously be an iPhone accessory, wouldn’t it belong on an iPhone event, like the one scheduled for September 10th? Maybe it won’t start out as a big thing, but rather as another hobby. Over time it could grow into something bigger, or not. Why? Because everyone was carrying a phone in their pocket back in 2007, but almost nobody’s wearing a watch or wrist band in 2013. But maybe I’m not thinking big enough. UPDATE: Jean-Louis Gassée is thinking in the same direction, but a lot further: No screen, disappears on your wrist, so you’ll wear it all the time, sensors, sensors, and foremost an accessory to the current line of devices. Posted on 2013/09/05 2013/09/09 Categories UncategorizedTags watch sensors identification notificationsLeave a comment on What If the iWatch is Another Hobby? The iOS home screen is extremely simple and consistent. It consists of multiple pages of icons, layed out in a 5-by-4 grid1. Located at the bottem is a dock, with four or five icons, that remains fixed across pages. 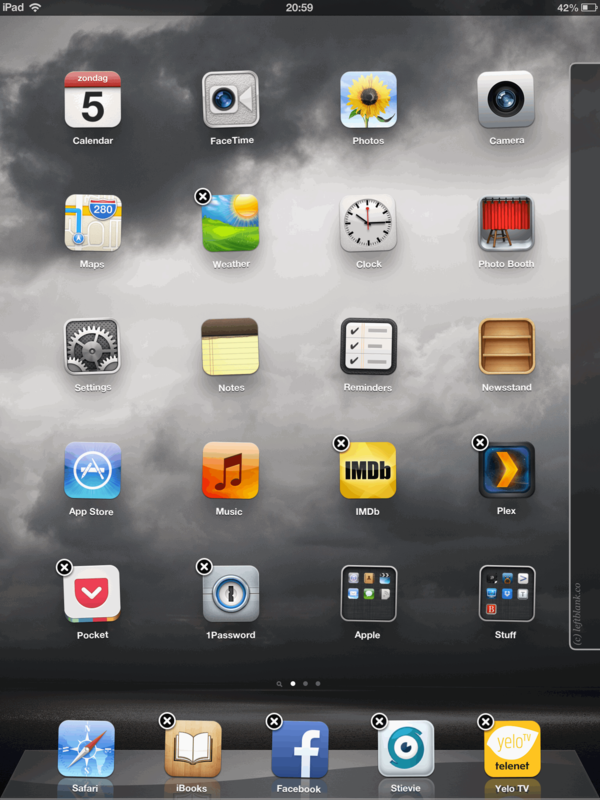 Each icon represent an app, a web-app or a folder of (web-)apps. Tapping an icon launches its associated app. Hitting the home button quits the app and returns you to the home screen. Over time, the avid person will collect a couple of screenfuls of apps. Every time he installs an app, iOS will add its icon to the first page, starting at page 2, that has free space left. Before long, the simple home screen becomes an unmanged mess of icons, roughly2 sorted by the date on which they were added. 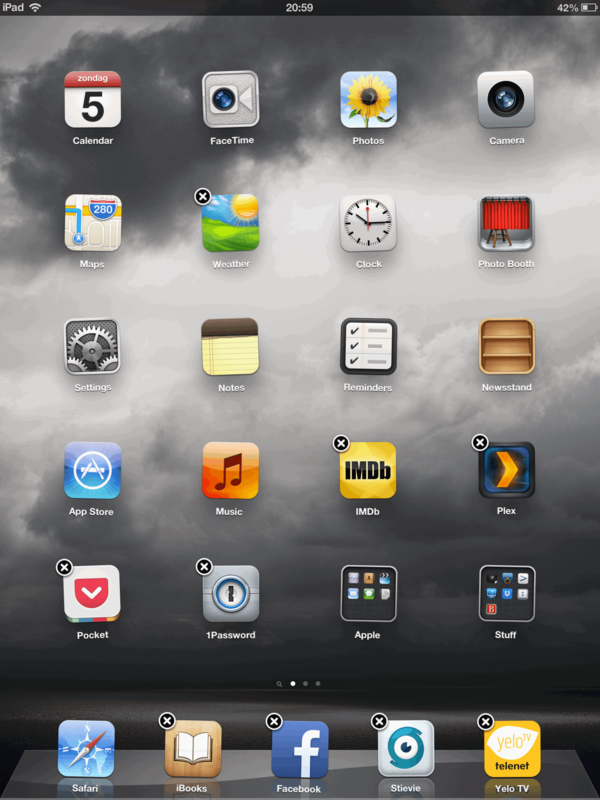 Fortunately, iOS allows the user to manage the grid of icons through what is called wiggle mode. It is called this way because it is visually represented by the icons that wiggle in-place. In this mode, a user can remove an icon by pressing the x-badge, or rearrange an icon by finger-dragging it to a new position. While this is straightforward, and even fun, inside a single page, it becomes very tedious when dragging icons across pages. Unfortunately, this use case is not uncommon, as users will often move their most-used and favorite apps to page 1, where they are more easily accessible. The most effective way to do this right now, is to add all these apps into a folder, moving the folder to the desired page, and then extracting each icon from that folder. However, considering that not all of the icons are located on the same page, collecting one icon into the folder will often push other icons to the next page, as the folder takes up room inside the grid. I propose a concept for rearranging home screen icons that makes it easier to move an icon (an app or a folder), or a set of icons, across pages. The concept is inspired by the way that Daedalus handles moving pages from one stack to another. 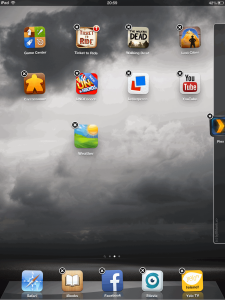 The concept consists of a dock-like pane, the wiggle pane, that appears at the right side of the home screen, as soon as the user enters wiggle mode. 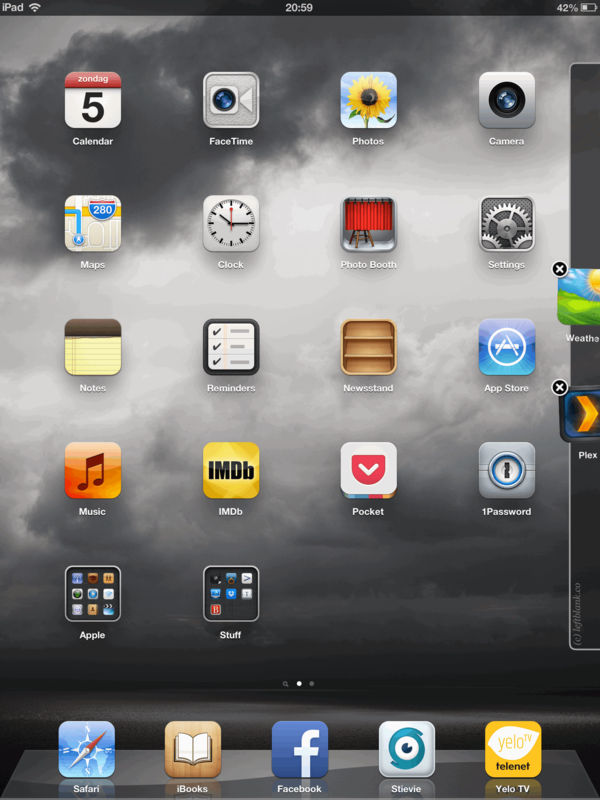 The wiggle pane, like the normal dock on the home screen, is fixed across pages. 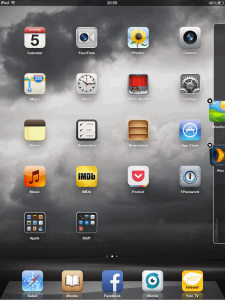 The wiggle pane entirely replaces the ability to drag icons across pages (by hovering close to the edge). Instead, the user can move any icon, app or folder, to the pane, as long as there is room left. 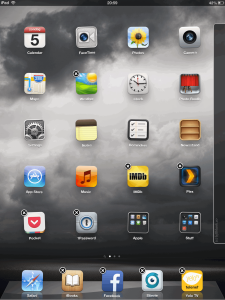 Icons in the pane will be centered vertically (like the dock on OS X). Because the pane is shared across pages, a user can move from page to page, adding the icons he wishes to move. Once he arrives at a target page, he can drag out an icon, into the desired location. Canceling wiggle mode while there are icons left in the pane, will cause these icons to be positioned the same way as when installing apps. The reason for this is twofold. Their original positions might have been taken up by a new icons (icon swap), so returning them is not an option. Cancelling wiggle mode with icons left in the pane, means that the user doesn’t care about their location. In other words, it reveals the intend that these icons can be discarded. While my illustrations of the wiggle pane are limited to the iPad, the iPhone could make use of a similar system. Because the space on the iPhone home screen is more limited, adding the wiggle pane might be a little more tricky though.